Church was easier for me today and I even interviewed a Canadian about the political situation in the US and his perspective of Korean politics as an expat. After church, we debated for a little while about what we wanted to do. Nate was feeling pretty tired and in need of some alone time. We had planned on just relaxing at home after church since we had been doing a lot. But the weather had cleared up and Dan & Annie’s friend Samjang was available to be our guide to Jigalchi fish market, so we collectively decided it was too good of an opportunity to pass up. Not everyone was excited about a possibly stinky fish market, but it is one of the largest in the world. I had to see this. 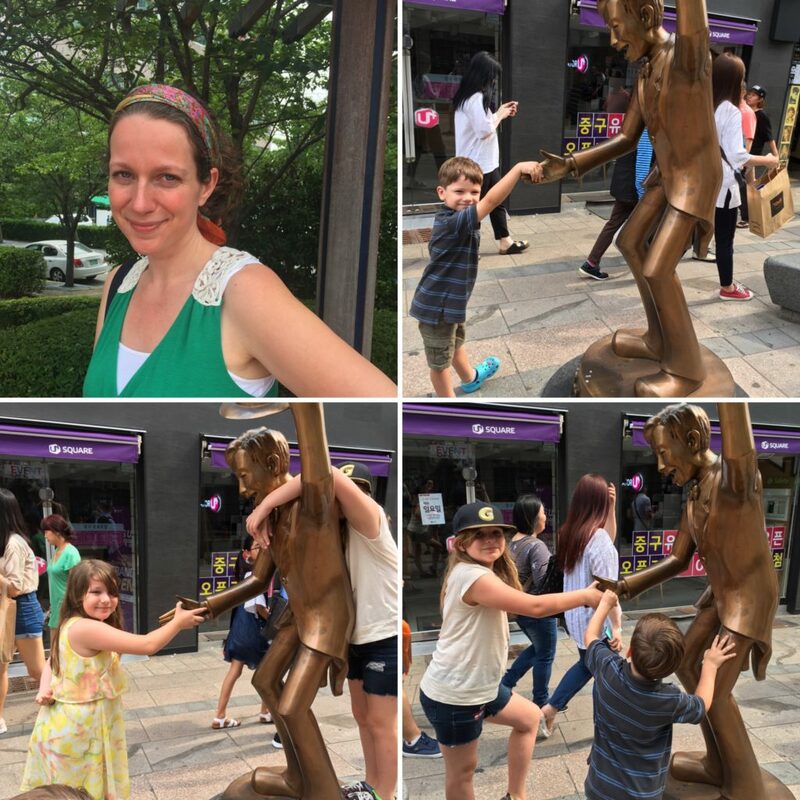 A few months ago, Conan O’Brian went to South Korea and visited a bunch of stuff around Seoul. It is hilarious. We wanted our own little excursion like his. We sent Asher and Dan off to the other campus to preach and the rest of us headed to Jigalchi in the van. As we mentioned before, the van is big and stick shift and not Annie’s favorite thing to drive, so Nate drove, following Samjang all the way there and then through what seemed like an hour wait in line at the nearly full parking garage. Apparently everyone else in Busan had decided to go as well. Driving in Korea is an adventure – you have to be both offensive and defensive. The things people do on the road don’t really make sense. Tons of lane changes, lots of honking and close calls, motorcycles going the wrong way through red lights, people not stopping for pedestrians at a crosswalk or honking at you if you do… but we made it. Jigalchi is a huge indoor fish market, with hundreds of vendors. It has dripping water everywhere. Fish tank upon fish tank. Big fish and little fish. Fish that look really weird like male anatomy. Eels that have been skinned, but are still alive. Fish jumping out of their tanks, I guess committing suicide. It got a little bit crazy when someone bought a fish and had them butcher it right there. Calvin and the girls turned around to look and might have seen the big butcher knife lop off its head. Hopefully they turned away. If not, a real-world opportunity to talk about the circle of life. Samjang asked if we wanted to try some of the fish. The easiest way is to exit the indoor market and head to the outdoor market with dead fish and a few tanks with live fish. We weren’t interested in a huge meal, just more of a taste. We wandered the outdoor market and it did not smell great. But the kids were troopers and it was something that they were at least curious about like the rest of us. Samjang helped to translate and get some fresh fish, which they killed once we went inside the restaurant. She ordered just a small amount for the 3 adults and 3 kids. But I will say that a ton of food still came. Fresh fish, raw fish, fish head stew, and all of the wonderful (or not so wonderful) side dishes. We were joking about who would eat the fish eyes. Maddy volunteered. Seriously? Yes, she was serious, but had to work up the nerve to eat the fish eye. She popped it in her mouth and tried and tried to chew it. Finally, after nearly half a minute, she spit it out. You can watch this action packed video too. We high-fived her and congratulated her on being awesome enough to try a fish eye. 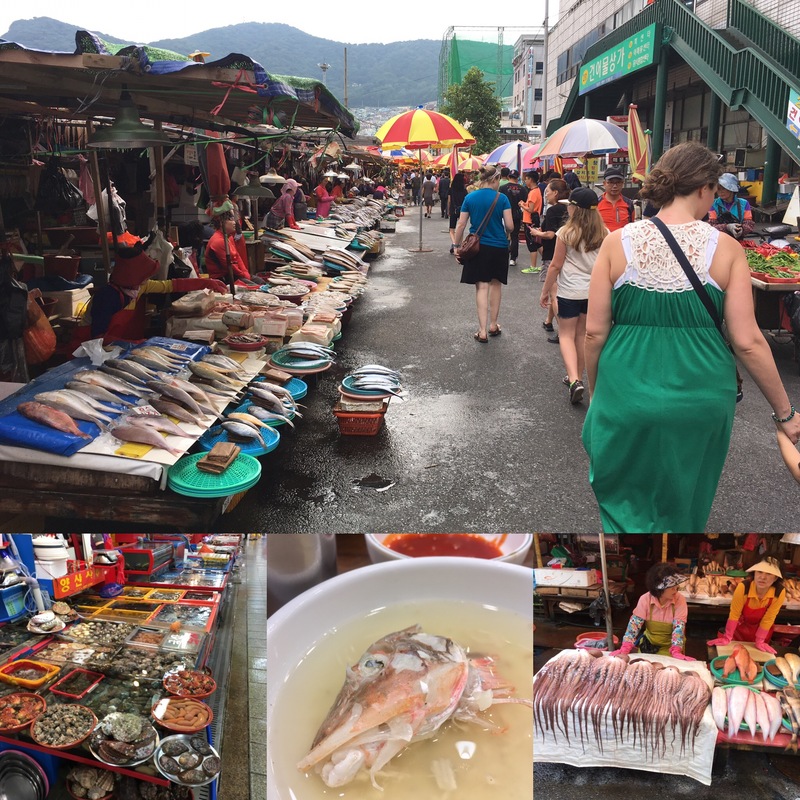 After the fish market, we headed to a big street market to try and get some souvenirs and sample the wide variety of street food. It felt like we stopped every few steps and ate another delightful (or at least interesting) treat: very fine, stringy, crunchy candy; pastries filled with honey and seeds; cotton candy is an art form here and seemed nearly as big as Calvin with multiple colors and in the shape of a giant flower; waffles with whipped cream; some kind of fried potato on a stick. Needless to say when Samjang suggested that we stop for udon noodles at this special place she knew, we tried to beg off that we were already more than full. But to no avail. We went into this restaurant that has only done udon (thick) noodles for the past 50 years. You know it’s a good place when you have to climb little narrow stairs and bash your knees. We ordered a few bowls of udon noodles in a sort of soup. It was fantastic and we were full. Very, very full. The street market is humongous and we had been walking for a long time, but the hunt for souvenirs was still on. I have a strange knack for finding postcards. We searched and searched and didn’t really see normal tourist shops or stands. Mostly electric fans and other home goods. Not really what I wanted to bring back as a memento. Finally, I walked down a lane and saw a few touristy things and inquired if they had postcards. They did! A big pack from in and around Busan. A few shops later and we had our South Korea flag patches and a few other fun small things to remember our time by. 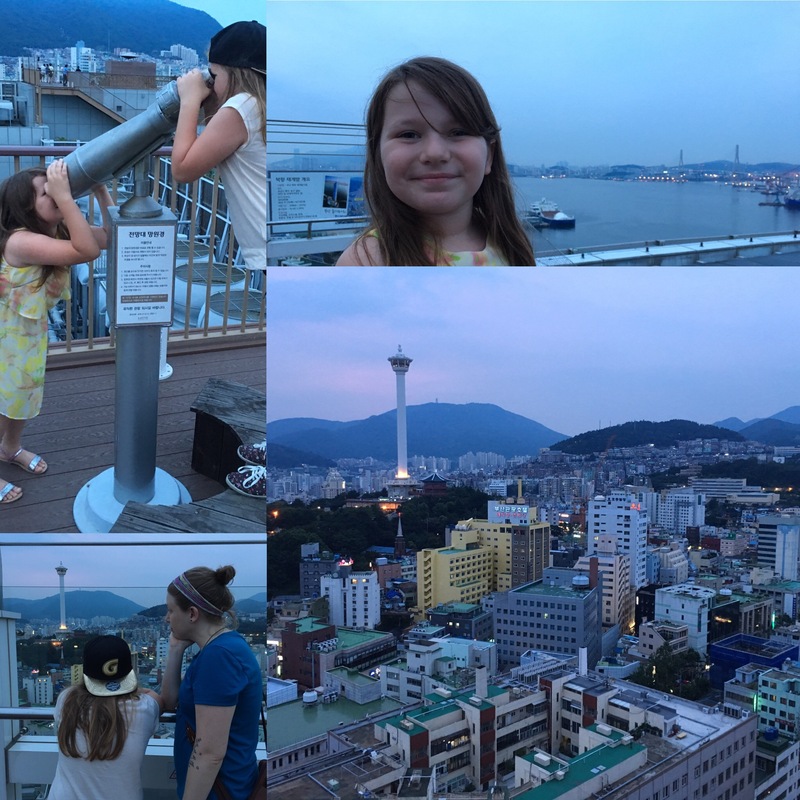 The sun was going down, but we decided to go on top of the Lotte department store and watch the sunset and the incredible view of the city. It didn’t disappoint.